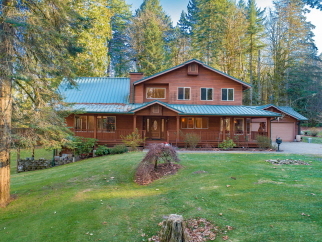 One owner, quality built, custom home on over 10 park-like acres! This home is set well off the road and offers plenty of privacy. Wrap around deck to sit and enjoy the quiet. Lodge style living room with vaulted, cedar ceiling, wall of windows, hardwood floor and fireplace! Kitchen is large and open, an entertainers delight! Cook island, built-in oven, bay eat area and dinging room, all hardwood floors! Master on the main with hot tub on the deck, double sinks, double closets, jetted tub and walk-in shower. 2nd master upstairs along with 3 bedrooms and full bathroom. Basement was a work shop or use as additional living area. Potential 5 acre buildable lot. Must see! Interior Features Oak hardwood floors; vaulted ceilings; fireplace; large kitchen; master on main; 2nd master upstairs; kitchen cook island. Exterior Features Cedar siding; metal roof; wrap around deck; hot tub; automatic on generator. Additional Features and Amenities Total of 3 lots being sold together, 5 acre lot has been perc tested and approved, buyer to do due diligence with Clackamas County.